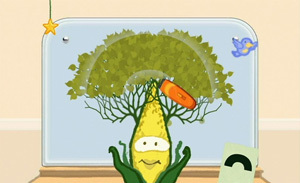 A WiiWare game that sets the player as a barber who has to clip, prune and groom their fruit and vegetable customers. You are given scissors, clippers, a comb and hairspray. Each plant has a request, and you are ranked out of 5 for meeting their request as closely as you can. There are a limited number of customers available each day. More challenging customers arrive as you prove your skills.